Dr Emma Williamson, Senior Research Fellow in the Centre for Gender and Violence Research, comments on why recognising the subject of violence against women has never been more relevant than it is now. 25 November marks International Day for the Elimination of Violence against Women, followed by 16 days of Activism against Gender-Based Violence. On this day, communities reflect on the damage caused by violence against women and its impact on women, children, men, and societies around the globe. As well as acknowledging the harm that violence against women causes, 25 November is also a day to celebrate the achievements of a movement which seeks to eradicate the gendered violence which many face every day. To recognise the men and women who work to support victims and perpetrators, to challenge abusive behaviours within societies across the world, and to stand up to the causes of violence by naming misogyny and oppression in its many forms. At the Centre for Gender and Violence Research based at the University of Bristol, we know only too well about the experience and impact of gendered abuse. Researchers are currently engaged in projects speaking to victims and perpetrators of a wide range of abuses; collecting official data from the police and other statutory bodies; working with refugee communities to address violence against women during displacement; and working with a range of non- governmental organisation (NGO) partners to ensure that research makes a difference in the world. So, along with our partners in the UK, Europe, and internationally, we mark 25 November as a day to recognise the achievements of a social movement which still has many uphill struggles to face. In addition to the consistently high rates of domestic and sexual violence and other forms of gender-based violence which are experienced every year, this year in particular is a poignant year. Women’s rights have been attacked in a number of countries around the world: Poland and its attempts to restrict access to safe abortions; US presidential candidates’ “locker-room banter” about grabbing women whether they want it or not; the re-trial of a footballer on the basis of the introduction of evidence about the victim’s sexual history; and the crowning of Bono as one of Glamour magazines “women of the year”. Okay, so the last one isn’t quite an obvious offence to women and equality – he does a lot of work about poverty and its impacts on women- but in a world where over half the population is female, it would be nice if an honour for women were given to one! These examples show the struggles which we face to challenge the oppression which underpins gendered violence and abuse. They also show us the power of solidarity in the many acts of resistance they evoke. Polish women striking and taking to the streets against the attack on their already limited rights. Michelle Obama’s eloquent speech about the everyday reality of sexism and misogyny. Government reaction to the use of sexual history in sexual assault cases. We have yet to see how sisters uncut respond to Bono but you can be assured it will be creative and fitting! Of course we also face an additional challenge in the UK with the recent Brexit vote to leave the European Union. The Centre for Gender and Violence Research in Bristol has a long tradition of working with European partners and we regularly meet to identify the emerging challenges which threaten the elimination of violence against women. Whilst the terms of Brexit remain unclear, we continue to appreciate the importance and power of a global network of campaigners, researchers, and activists challenging the status quo and fighting for women’s human rights. In Spring 2017, the Centre will be launching a new Journal of Gender-Based Violence. This is the first European- based international journal focusing specifically on this type of violence and abuse. We believe that now, more than ever, we need a space where evidence, policy, and ways of tackling gender-based violence across national borders, can be shared. It will provide a critical space in which we can continue to learn from one another and recognise the connectivity between the different challenges we face. To articulate how far we still have to go, take a moment to look at the predicament of women worldwide below. 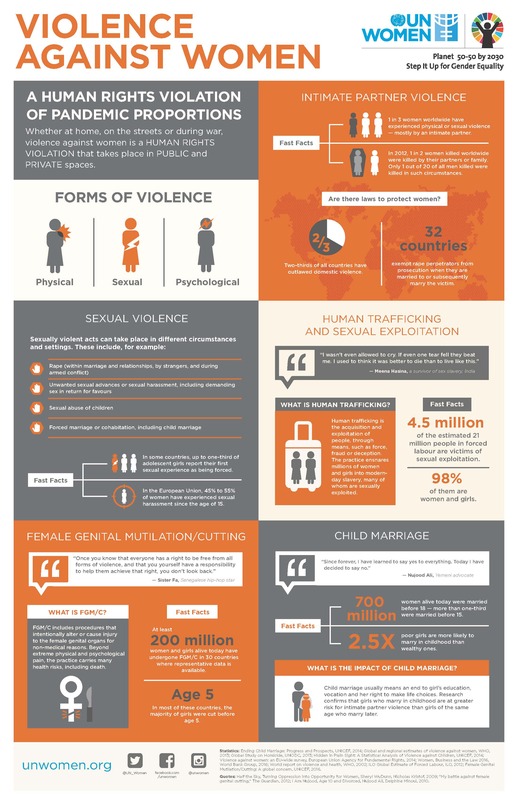 (Infographic reproduced with kind permission from United Nations Women). This entry was posted in Gender and Violence Research, School for Policy Studies, Uncategorized and tagged abuse, Bono, domestic violence, gender violence, Glamour awards, Human Rights, misogyny, sexism, sexual violence, violence against women by policystudies. Bookmark the permalink.